US, 1930, 89 minutes, Black and white. Greta Garbo, Charles Bickford, Marie Dressler. 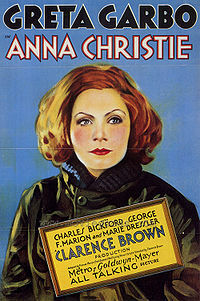 Anna Christie is Greta Garbo's first talkie. The advertisement read 'Garbo talks.' This film is based on a play by Eugene O'Neil, previously filmed in 1923 with Blanche Sweet. It takes up some of O'Neil's themes of the Irish Americans, drink, prostitutes, reputation, interactions, sailors and the sea. The film is virtually stage bound - following the outline of the play and keeping much of its dialogue. This makes it very static for contemporary viewers. However, it is well produced and directed by veteran Clarence Brown (who was to direct Garbo in Anna Karenina and Marie Walewska). Garbo is very effective (though not always believable) as Anna Christofferson, the orphan brought up in Minnesota, becomes a prostitute, coming to New York to find her father and make good. She is a very expressive actress in her mannerisms, body movement, facial expression and tone of voice. Charles Bickford, in an early film role, is the Irish sailor Matt. Marie Dressler (soon to be an Oscar winner for Min and Bill) is rather stage style in her acting of the friend of Anna's father. The film is interesting in being one of the early talkies, a version of Eugene O’Neill’s? plays, treatment of American themes - and surprisingly modern sounding idiom for the 20s and 30s. 1. A famous Garbo vehicle? Eugene O'Neill play? Americana? 2. M.G.M. production values, the black-and white photography, the use of the sets, interiors and few exteriors? Musical score? The strong cast? 3. The title, the focus on Anna, her adapted name, her background, the American migrant woman and her dilemmas? 4. The importance of the dialogue, the strength of O'Neill's words, idiom, interactions, revelation of character, dramatic conflicts? The stage quality of the words and their recitation and dramatic presentation? 5. The build-up to Anna's arrival, Chris and the bar, Marty and her relationship with Chris, the drinking, sailors? Chris and his Scandinavian background, not having seen his daughter, anticipating her arrival, idealising her? The irony of her arrival and meeting Marty, the drinking together, the talk? Marty summing up her character? Anna seeing Marty as what she would eventually be like? The inter-action between the two, Anna's background, the farm, wanting to get away, prostitution? Her meeting with her father, the reconciliation? Living with her father, working for him? Going on the barge? The chance encounter with Matt in the fog, his falling in love with her, her falling in love with him? Concealing the truth? Their talk, interaction, going to the carnival, the competitions, her admiration for him? His declarations and the effect on her? Meeting Marty, Marty insinuating the truth? Anna telling Matt the truth, his inability to cope? The father and his disappointment, not wanting to believe? His enlisting, Matt's enlisting? Matt's return, his apology, finding out whether she was in love with any of the men - the religious differences, his wanting to marry her? The possibility of a future for Anna? The victim and making good? 5. Chris, the Scandinavian sailor, abandoning wife and child in Minnesota, correspondence by letter? Work as a sailor, drinking? His relationship with Marty? The friends at the bar? Idealising his daughter, meeting her, the reconciliation? On the barge, the possibility of Matt marrying her? The clashes? The truth? Enlisting on the boat? The reconciliation? 7. Matt, the Irish sailor, coming out of the fog? Attracted to Anna, talking, in love with her? On the barge, on land, going round the fair, demonstrating his strength for her? Proposal? Finding out the truth, not being able to face it, going out and getting drunk, enlisting? Return, greater understanding, love and a future? 8. Marty, the old woman and her drinking, living with Chris? The drinks, the bar, meeting Anna, summing her up, the insinuations? Deciding to leave? Meeting them at the carnival, the insinuations? A pathetic character - but with strength? 9. The atmosphere of the bar, the drinkers, the sailors? The barge? The fun fair? Authentic background for the character drama?